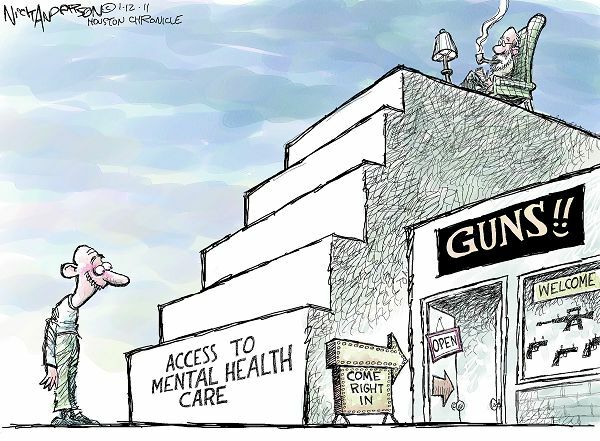 An editorial cartoon comparing accessibility of mental health and guns. “There’s a moral price to be paid for inaction,” he said. We have certainly seen significant debate around what action to take in addressing America’s gun violence epidemic. From universal background checks to regulation of video games, and from arming teachers to banning assault-style weapons, there are no shortage of proposals nor sides of the issue. One proposed solution to the issue of gun violence that has some consensus is addressing accessibility to mental health services. Recently, the Governor of Wisconsin, where the massacre of six Sikhs took place in Oak Creek, proposed a significant investment in mental health services in his state. However, as I stated at the time, it is unclear whether increased access to mental health services would have prevented white supremacist Wade Michael Page from his rampage at the Sikh Temple of Wisconsin. In the rushed attempt to find quick solutions to gun violence, the mentally ill — a group largely marginalized already — have become the guilty in the gun violence debate. The plight of those suffering from such diagnoses has moved from being a health care issue to a law enforcement issue. However, this does not appear justified based on the data available nor on the characteristics of most of the perpetrators of mass gun violence. Twenty percent of Americans have some form of mental illness, yet less than 5 percent of all violent acts in the U.S. are committed by individuals with a mental illness, according to the Institute of Medicine. However, this perception is not consistent with reality. For example, the perpetrators of the massacres in Oak Creek and in Aurora, Colorado, were not considered to be mentally ill. Moreover, the mental illness of the young man who perpetrated the murder of 20 children in Newtown, Connecticut, was found to not be associated with such acts of violence. More striking, it should be noted that the Newtown shooter was an admirer of the 2011 terrorist acts in Norway of right-wing Christian extremist Anders Breivik. It should also be noted that the shooter in the Oak Creek massacre was also a right-wing extremist. Much like after 9/11, when innocent Muslims, Sikhs and others South Asian descent have been racially profiled, or during World War II when innocent Japanese Americans were profiled and locked into internment camps, we are seeing a similar phenomenon occur with those who are suffering from mental illness. Today, innocent people who have a mental illness diagnosis have become a threat, but their rates of violence are low, while the recent perpetrators of mass violence exhibit behaviors and characteristics that have not often been talked about to the same degree. The issues of white supremacy and extremism have remained as unspoken truths. While policymakers continue to focus on everything-but, the role of white supremacists and right-wing extremists in perpetrating such acts of violence remains under the radar. This is not simply incidental. In 2009, politicians and policymakers aligned with the Republican Party lobbied extensively to have the Department of Homeland Security (DHS) cease focusing on the threat posed by white supremacy and domestic terror groups. As Daryl Johnson testified during the Senate Hearing on hate crimes and domestic extremism back in September, the ability for our law enforcement agencies to address this source of violence has been severely impaired. Today, the DHS does not even monitor social media for white supremacist indicators, even though we know that this forum is a means for recruitment and spreading hate propaganda. And, in the FBI testimony in the same hearing, the focus on white supremacy was primarily in relation to being a threat to government and public property. It is no wonder, then, that the FBI quietly closed the investigation into Oak Creek, leaving untouched the threat posed by white supremacists and extremists on the American public. AS a nation, there is comfort in the notion colorblindness and the post-racial, however, the reality of colorblindness and post-raciality quite literally means for one, the denial of difference, and secondly, the renunciation of the American nation-state’s historical legacy of racist violence against blacks, immigrants, and communities of color. We’ve reached a point here in America, though, where we believe the worst of racism is over and the remaining animus is either not worth mentioning or dying off. Neither is true. Racism is the foundation; it literally built this country. It’s going to keep showing up. Denying that doesn’t solve the problem, it exacerbates it, making it so we can’t ever achieve real solutions. So, as Sikh Americans, let us focus on real solutions, reminding our policymakers and law enforcement agencies of the folly in creating pariahs of innocent groups. Our South Asian communities know all-too-well the consequences of such post-crisis profiling. To allow such to occur in silence, we too are paying a moral price.